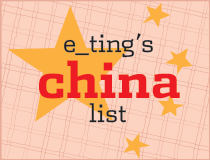 e_ting: Ho Lee Fook - Where is Chinese Food Going? Ho Lee Fook - Where is Chinese Food Going? Yes, yes, the restaurant's name is intentional. That's basically what Ho Lee Fook is about - tongue in cheek, not too serious, funky Chinese food. It's not a throwback to Chinatown Chinese (like Fu Lu Shou), but I'd say its an example of the evolution of Chinese cuisine. On the Sizzle and Fry Show, we did a segment on where Chinese cuisine is going, in which we spoke to Jowett of Ho Lee Fook and Daniel of Seventh Son, and the discussion is an interesting one, as Jowett sees parallel tracks of modern & traditional, rather than a transition, and he sees himself on the modern track, whereas Daniel is focused primarily on preserving the traditional. I mean, look at French, or Spanish - the classics have survived, but there is a strong and well-established parallel track of Modern French and Modern Spanish. So as a fairly proud Cantonese old lady, I can say that I love the classics and yes, we must try our best to pass on those skills, techniques and philosophies, but I'm also hoping to see a stream that we can properly call "Modern Chinese". I feel like we're way behind in that regard. The strange thing is, modern Asian cuisine seems only capable of coming to Hong Kong via other non-Asian cities. My classic examples of modern Chinese in HK at the moment would be Ho Lee Fook and Little Bao - both the chefs there are of Chinese origin, but have spent time abroad, which begs the question - must modernity come from a mix of local and foreign experiences? Remind me to bring that up in my next drunken whisk(e)y session, or don't. These forays into what might be the birth of "Modern Chinese" in HK is pretty exciting to me, because the food is actually, for the most part, good. The good ones reference flavours and textures we know and love but present them in a new, "it works so well, why didn't I think of that?" way. 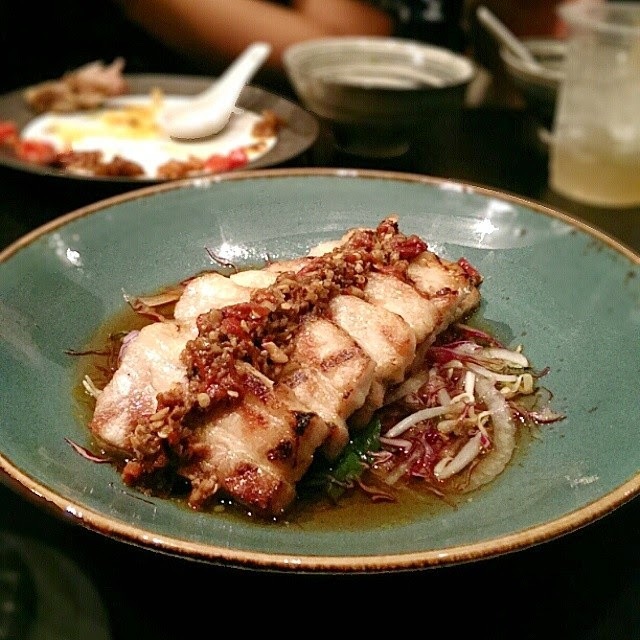 Not just experimental for the sake of it, superficial with "twists" on Chinese food. So let's get to the food. In short, it is pretty spectacular. These are some highlights from two separate nights I went, once in July and the other in October. When the restaurant first opened, we were asked to fill out comment cards. One of the comments I had was that while the Cantonese roast meats were good, I didn't feel they were that special, and therefore maybe weren't worth the extra effort. (This effort is amazing, though, as they have a dedicated oven for Cantonese roasts). However, I'm glad to say that the second time I went, the roast goose was amazing. 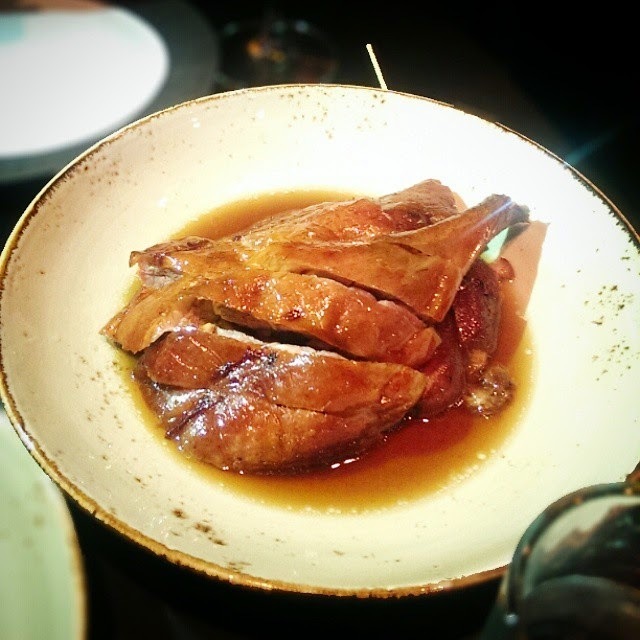 The skin was crisp and the goose itself was just-cooked, maybe even a bit under, not the usual over-cooked that classic Cantonese roast sifus go for. 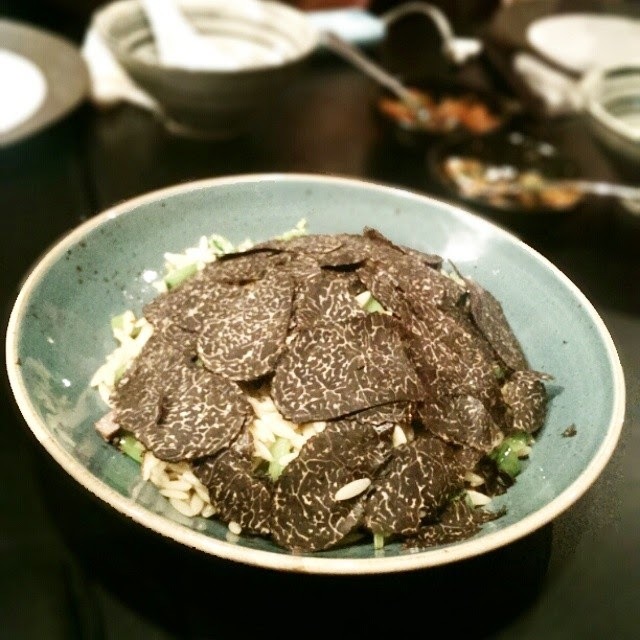 The first time we went, it was still summer truffle season, so we had this black truffle risoni. The risoni was cooked like a fried rice, which I felt didn't necessarily have the (nice) dryness of individual grains of rice that is a classic hallmark of good fried rice. Instead it was kind of like a lo meen wetness, which was good too, just not what one might expect. By October, it was lap cheung (Chinese sausage) season, so a new kimchi and lap cheung fried rice wasreleased. 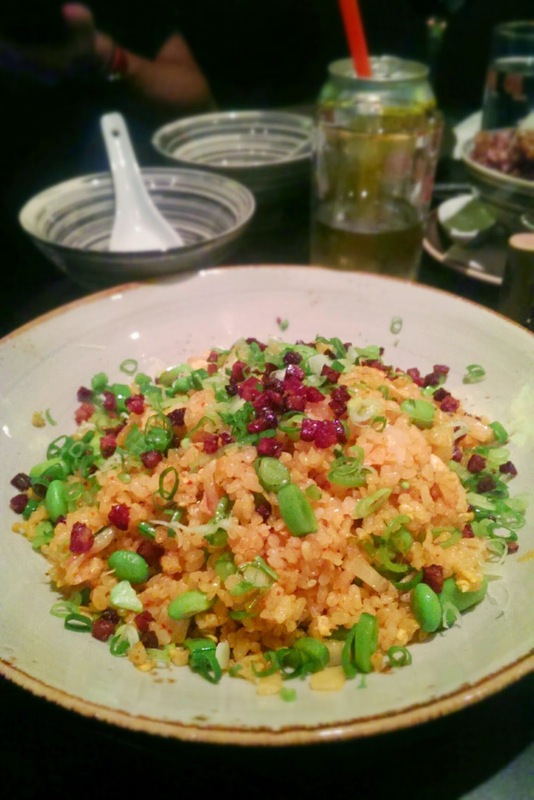 Seasonality in a staple like fried rice - who woulda thunk! The lap cheung was sweet but diced so finely they were like mini meaty croutons adding bite to the rice. 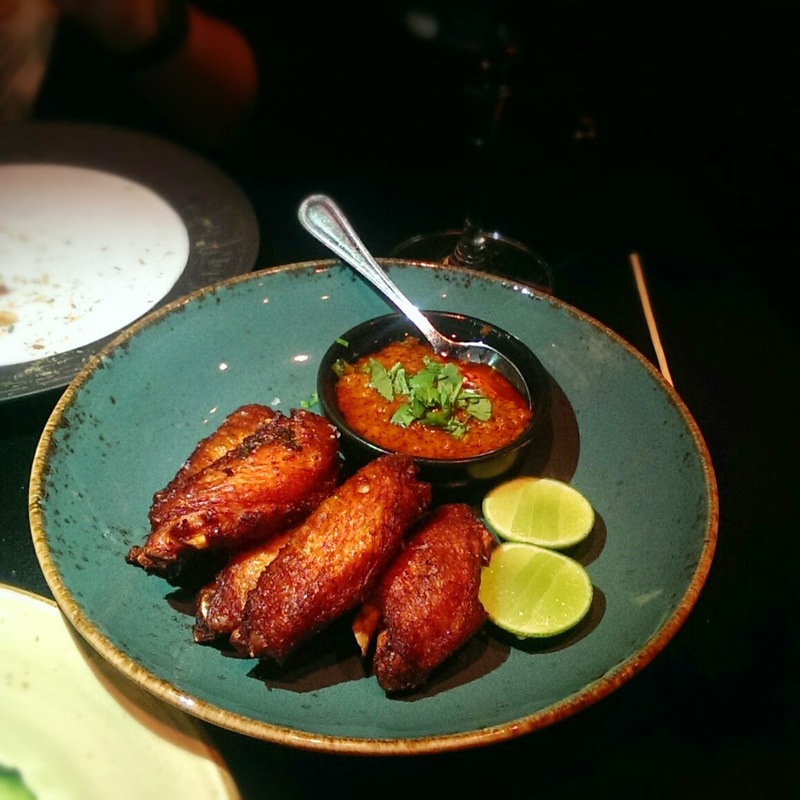 The sambal chicken wings are, well, properly deep-fried wings (and who doesn't like those) - juicy, tender and so on, but the main attraction is the sambal. The array of pickles, sauces and the like made in-house at Ho Lee Fook are extraordinary, but this sambal in particular is rather addictive. One of the times I went it tasted better, more seafoody, shrimp-pastey, intense. The other time, from the texture it would appear that maybe it hadn't been mixed around in the container enough (or maybe too much?) as the nice chunky, more solid/intense parts of the sauce had disappeared. Other good dishes are the sang choi bao (a pig's head version is sometimes available - ask if you're into um, heads...), and the pork belly with almond salsa. I loved the thick slices and melting layers of fat, both of which kept it super juicy. The char finish reminds me of the Japanese chashu on the ramen at Afuri in Tokyo - ie. first braised/poached/slow-cooked, charred a little just before serving. Rather genius. Breakfast 2.0 - Horlicks ice cream! 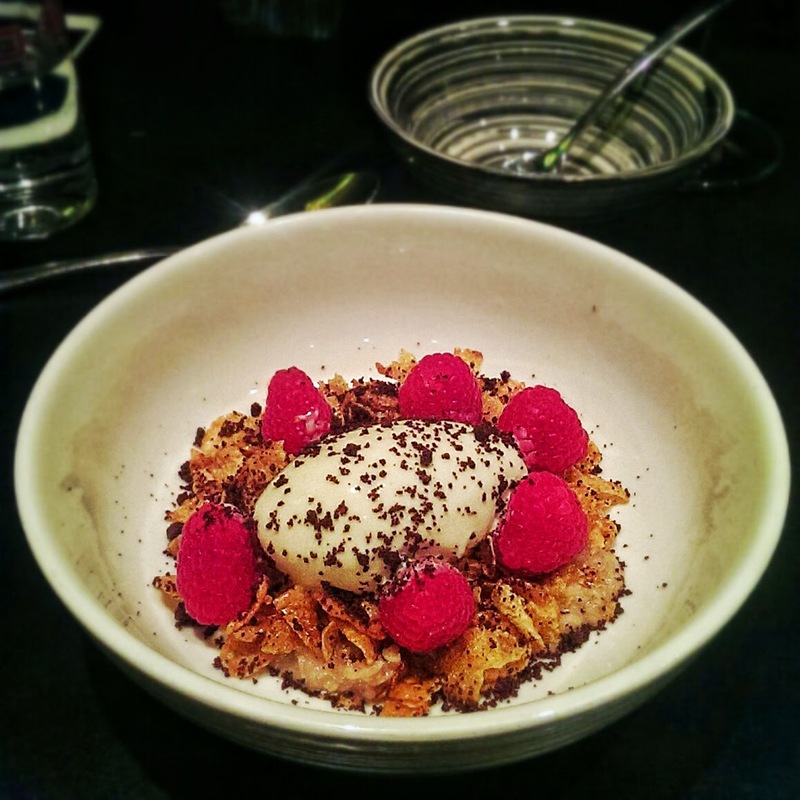 Like Susan (Jung) says in the opening line of her review in the SCMP, it would be easy to dismiss Ho Lee Fook as just another hip restaurant with a lot of frills and no substance, but that's definitely not the case. (Funnily enough, I filed another piece before Susan's review came out saying almost exactly the same thing). To call it Chinatown Chinese (with the connotation of it being inferior), as some have done, is to grossly misunderstand how food and culture evolve, kind of like believers in an absolutely "correct" grammar or word usage - there's no such thing. I can go on about this forever, but that would be going off tangent completely and blabbering on non-stop (what's new). 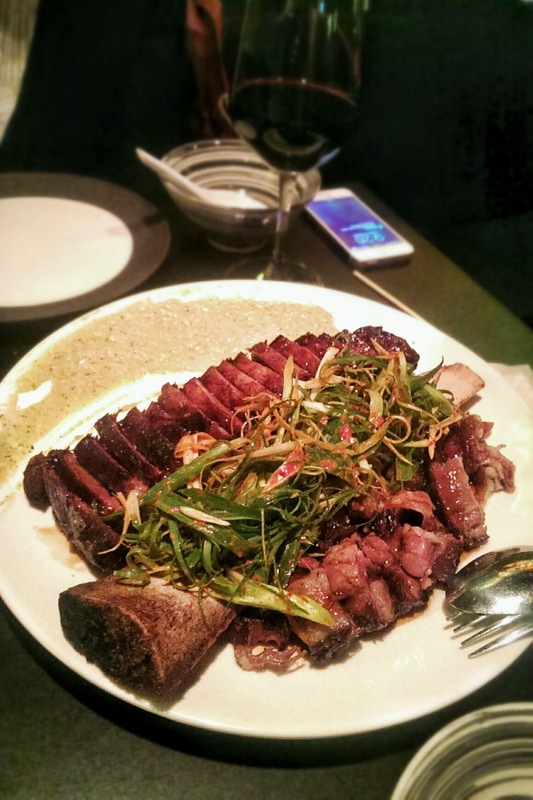 Wagyu shortrib again - a must. And compare the 2 pics: Consistency WIN. One last thing - yes, the no-bookings policy is annoying, but go in a group of 5 or above and you can book. After all, Chinese food is designed to be shared. 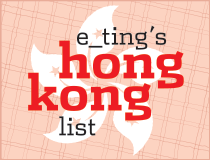 ive heard great things about this place, cant wait to hit up hk in a few months to try it out! Here's some food for thought. 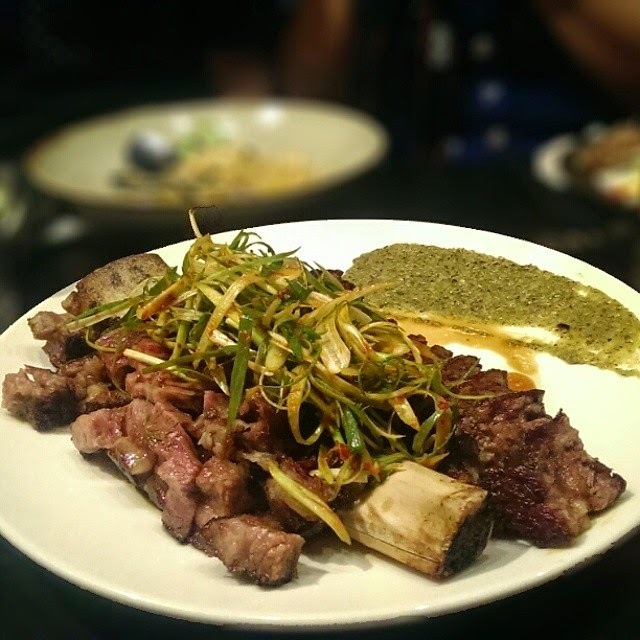 When one looks at Peruvian cuisine vs Chilean cuisine, chefs in that region carry a different view to us diners. Chile is world famous for their seafood exports, prawns abalone lobsters fish, you name it and they supply it. However in their original Chilean cuisine there is nearly no seafood staple, they mainly eat pork there.... And Peru and Chile actually share so many similarities in culture too, all the way down to their national drink in a Pisco Sour. After all they are just next door on the map! According to Chefs from these regions, the reason why Peru has so much more seafood courses than Chile is because Peru has much more Japanese and Chinese immigrants and they know how to handle the seafood. And Brazil also has so many Japanese immigrants. Hence we see so many Japanese x South American dishes, also French or Dutch and Indonesian fusion dishes down that area. The Carribeans is still largely controlled by the French/Spanish/Dutch and have a lot of Southern American or Miami influence! And surprisingly when I was working in South America, I was really shocked to hear that a lot of dried fishes and seafood were exported to Chile or Panama and someone was raking in millions from this business. It actually made sense in the end though. A lot of Chilean people live in the mountainous regions and Dried Fishes last much longer without a fridge, just like Japan used to carry fermented fresh water fish Funa-zushi especially around Shiga prefecture. And with almost all Chilean seafood blast-chilled and then exported overseas, the locals actually didn't have any access to any Dried Seafood and had to rely on their neighboring countries to supply them. Ok I got off-tangent a bit, but my point is, when Peru or Brazil makes a Fusion dish, it actually has a reason. Much like Hawaii and Guam and Okinawa or even Yokohama make fusionized dishes due to the historical cultural background with Americans. There is a history and and large crowds of immigrants. Much like New York and Melbourne has so many Italians but somehow they make their own Italian food styles. And Hong Kong has remnant Colonial dishes like Baked pork chop rices, HK French toasts with Kaya or Peanut Butter, Egg Tarts, Spaghetti in Campbell soups, HK milk teas using Holland Black & White condensed milk when nowhere else in the world will they supply them to. And Cantonese wonton and jia zhang mian noodles aren't technically Cantonese, they are more Northern Chinese and cuisines are transitional. You see the same dishes throughout Europe because of Romans influence, and the French and British nobles spread the Wine and Food culture across multiple countries. Switzerland speaks French and German depending on where you are. German food on the east is Austrian/Polish based, In the Alps, Italians, Swiss or French or even Belgians share similar food, many French actually use Olive Oils and cook Pizzas and pastas. In Southern France you see people compete with Spanish Basque in Pintxo/Tapas competitions. And then there's Macanese Portuguese tarts in Macau when they don't even taste too much like the ones in Portugal with more custard and cinnamon and powdered sugar. Similarly and vice versa, Europe especially in UK and France is doing a lot of Chinese Teas nowadays. France and Spain borrow so much from Japanese techniques and ingredients, The Robuchon L'atelier counters are a Japanese Omakase counter concept. What I am saying is that many of these things have "Traceability" and a reason. It is confusing but will still go down written in history books. Sambal, Kimchi, Jalapeno. Orzo Risoni. Truffles. As an exploratory eater, I am always in support of Evolutions in cuisines? But personally where is their origins and culture coming from ultimately?